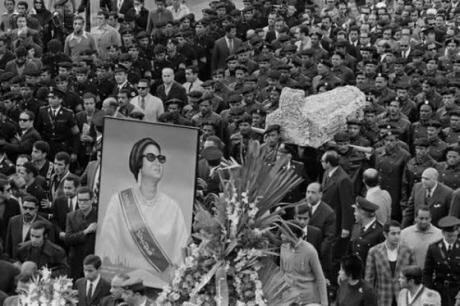 Funeral of Umm Kulthum, 1975. Middle East Broadcasting Center. Public domain. This is a response to HAU Hebbel am Ufer's statement regarding the criticism surrounding their event "Diva: Celebrating Oum Kalthoum // Ariel Efraim Ashbel & friends"; and the article appearing in Der Tagesspiegel where HAU director Annemie Vanackere dismisses the criticism as "identity politics", portraying a "theatre" of "multiculturalism" and "bridges". I had the opportunity to meet Ms. Vanackere when I participated in a panel at HAU that centred (in part) around some currents in the "white left" and European art circles refusing any criticism towards Islam in the context of fighting Islamophobia. Something I am against. Islamophobia is a serious form of discrimination, and it should be faced, but it shouldn't become a lazy argument to discredit critical voices within Islam or around it. Back then I also spoke about the complexities in my own personal experience of being a Queer, Muslim, Atheist, Migrant living in Germany with a set of privileges (lighter skin, artist stature..etc). I think there will be a letter that is being prepared by Arab and non-Arab artists to respond to the event, and to detail the criticism. But I decided to speak up as the article in Tagesspiegel is quite dangerous and to be honest, offensive. Above all, it is offensive to the intellect of those who have engaged in discussion with the artist and HAU to detail the reasons for why this event is problematic. Germany has a particular condition when criticising anything that has to do with Israel. The same line of lazy thinking that I was against during the HAU panel: using Islamophobia (which is existing and rampant) to discredit criticism. Allusions of anti-semitism (which is existing and rampant and should be faced) to discredit any type of criticism towards the Israeli government. Many artists/academics in Germany are afraid to speak when it comes to such topics. I do of course risk ostracisation and being "blacklisted" from funding or from spaces to work - similar to what various friends from Jewish Israeli artists and activists based in Berlin are suffering as consequences of their criticism of the Israeli government or Zionism. This particular case is not about HAU, and this is not about this event. This is about intellectual and artistic spaces being used to quash a side of the debate, to delegitimize voices and valid criticism instead of engaging in the much needed intellectual debate about appropriation, depoliticization, re-appropriation, colonial discourses and an intentional cognitive dissonance to protect a hegemonic self-congratulatory /theatre/ space of openness. “Sometimes people hold a core belief that is very strong. When they are presented with evidence that works against that belief, the new evidence cannot be accepted. It would create a feeling that is extremely uncomfortable, called cognitive dissonance. And because it is so important to protect the core belief, they will rationalize, ignore and even deny anything that doesn't fit in with the core belief.” Frantz Fanon - Black Skin White Masks. "In the Arab world Oum Kalthoum’s work is of deep significance and how it is interpreted is followed with critical interest: Is an Arab, Jewish Israeli, working with Arab musicians, allowed to interpret the songs of an Egyptian icon? In order for a work, which can doubtlessly be considered world heritage, to retain its vitality and even expand its reach, it should be open to interpretation. Ariel Ashbel has already done this during the first version of "Diva: Celebrating Oum Kalthoum" last year at the Berliner Uferstudios. The concert there brought together people from the neighbourhood, making Oum Kalthoum’s music accessible to them and giving life to the idea that a concrete encounter between individuals is still possible despite any political tensions and conflicts. We consider it important to give space to this idea and invite all of you to attend on January 6 and 7 at HAU Hebbel am Ufer." Instead of addressing the political and intellectual arguments presented, HAU rather opt to feed the very same liberal narrative the event was criticized for. This white "laissez-faire" artistic space that is void of a critical approach and that fails to address key complexities. The criticism is not about an "Arab Jew" working on Umm Kulthum per se. It is rather about an Israeli working on Umm Kulthum and striping her, forcefully, out of the politics she represents. I will not delve into the sexism of depoliticizing such a political female voice as that is a whole set of other points. Umm Kulthum was and still is an iconic singer and a key political figure that enjoyed massive political power - too nationalist for my taste, but nevertheless. It is about a (self-identified) Israeli artist who despite denouncing the crimes of his government (check his statement on his personal page), fails to see the implications of his art. 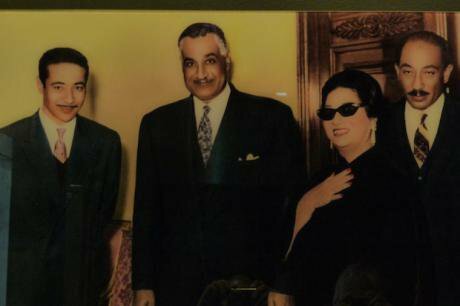 Umm Kulthum alongside Gamal Abdel Nasser and Anouar Al Sadat. (CC BY 4.0)There are much bigger postcolonial implications of this beyond the Middle East. In an earlier comment, I mentioned similar problems if I was as an Arab artist to tackle Amazigh or Kurdish topics or art (to name a few). Similar if a Spanish artist was to tackle Mexican art. Just like the artist, I too have left to "laissez-faire" in Berlin. But I do take responsibility for the hegemony of the Arabic identity on the cultures that have suffered from its colonialism. When I want to "build bridges", I start by my own side of the bridge, by listening and learning. HAU uses the Mizrahi identity to give the artist a carte blanche. The debate could be richer if we dissect both the Mizrahi and the Arab identities and engage in dialogue around them. We can also talk about the Israeli construction of a Mizrahi identity, and the Arab identity in relation to the Israeli. Both culturally and politically. A rich discussion. The artist is the product, by choice or not, culturally and economically, of the very power that Umm Kulthum was resisting, "remaking" her to fit a narrative she didn't subscribe to. To work around all those complexities require a space for discussion, not an imposition. The artist himself/themself doesn't speak a word of Arabic and in his previous presentation he couldn't even translate the titles of the songs he worked on and was presenting. He lacks the necessary understanding to make anything about Umm Kulthum "more accessible". And by doing so, he and HAU are risking to present an erroneous image of an icon that encompasses issues of high cultural, political and social importance. Take for example the singer, with due respect to her efforts; she fails at the most basic of the ins and outs of Arabic Tarab and her Orab (عُرب) are a miss. This is key to understanding Umm Kulthum to make her "accessible". If you take away the politics, the Tarab component, the figure she was/is, what is left? A reduced gentrified image of an icon. Umm Kulthum raised funds for the resistance against Israeli colonialism and was a militant in nationalist politics at the time to resist worldwide imperialism. She played an active political role both on state and public levels. I can of course include my criticism of the power she enjoyed and some of the politics she portrayed, but that is not the point here. Rewriting her to feed a narrative she vocally resisted is unfortunate. Umm Kulthum didn't subscribe to "music for music" or "art for art" (to be honest I don't know anyone who does). The criticism is about a discourse of cultural hegemony and appropriation that is very well known and which many of us non-white artists are witnesses to and sometimes victims of. It is also about token representation that aims to evade the responsibility rather than embrace the dialogue and the complexity. There are organized efforts worldwide between Israeli and non-Israeli artists to collaborate and work in ways that do not feed the narrative of power and respect the plights of the oppressed. I invite you to educate yourselves on that. It is more constructive than being on the defensive. All sides learn from a constructive discussion. Multiculturalism and bridges, if they are to be constructed with respect, require discussion and care - sometimes painful, at times uncomfortable, but nevertheless necessary. Your response is unfortunate. I do give you more credit than that. The artist wrote a much better response on his personal page and though he failed to address a good chunk of the criticism; he understands the complexity to better extents. I again recommend a Fanon reading, even Amilcar Cabral. I invite you to engage in debate. It is not a win/lose situation for anyone, it is a chance for an important intellectual and artistic dialogue and discussion to happen. Multiculturalism and bridges, if they are to be constructed with respect, require discussion and care - sometimes painful, at times uncomfortable, but nevertheless necessary. Be the space to embrace it, not the space to quash it.